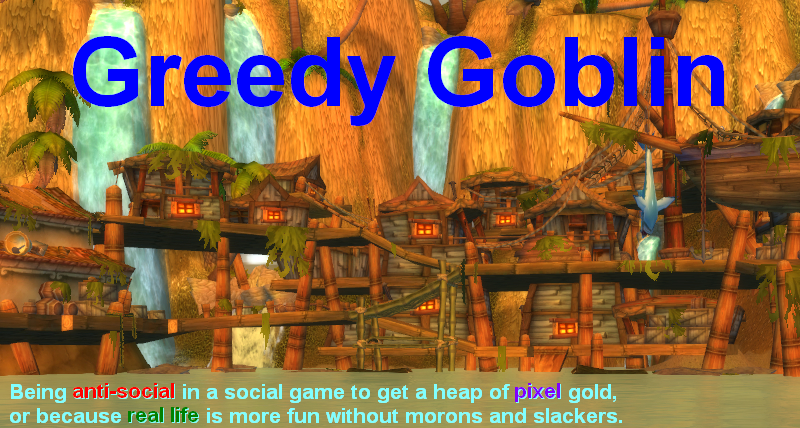 Greedy goblin: Build train FFS! I had a pretty bad experience in Wintergrasp. While it's no longer the guild's focus, WG is still a good place to play. On Agamaggan the horde-ally ratio is better, the ally controls WG about 20% of the time. With proper strategy, it can be won. On the mentioned WG, we were collecting promotions, about 4 were missing. We were patrolling around BT, killing stray hordies and NPCs. A player named lifegoeson (another example that stupid name usually covers a stupid player) were standing in BT with a siege. He most probably spawned with the rest, participated in the zerg fight between the fort and SR and got promoted. So far, so good. While I'm not the fan of the zerg fight, as it can end with a wipe, providing promotions to the enemy and throwing us back to the GY, it's a legitimate strategy. So he was lucky, got promoted and got a siege. And just stood there, refusing to go to the wall. "We need mor ppl" and "lets make train" he was spamming. After a couple of mins, enough people went to BT to form a train. We lost the game of course. Siege train is good for one thing: making defense happy. They can fight in one place, holding formation, while the assault team must advance. Many of the assault are sitting in vehicles, being unable to fight back. Sieges stacked up for AoE or well-aimed RP-GG. Result: total wipe. I've seen it so many times on Maghteridon. Even with 15 of us vs 2 full raid of horde we could stop the "train". The badness of the "train strategy" was so obvious that I couldn't imagine how could anyone fall for that. But still, people went to BT and waited for the train. It wasn't just some random nonsense. Morons don't wait, they "jump in the fun" engaging in pointless PvP in some worthless position. These people had a strategy, despite an obviously wrong one. I tried to convince them to leave west and come from SR. Wasted too much time trying, as we needed one more minute to win from SR when time was up. The horde were all west, our demolisher could get in if I don't waste time arguing them. But again: I did not understand what's going on. They had a strategy, they wanted to win, they were not some "lets pwn lol" kids, yet they did something absolutely stupid. It took some time to figure out what was going on. Actually I've seen this. "Group up", "be with many friends" is a core code to the socials, especially when they feel threatened. It's obviously working for animals, the bigger ape horde defeats (and often eats) the smaller one. It's even works in WoW PvP if your objective is killing people. The bigger zerg defeats the smaller (assuming similar gear/skill). However in the game the objective is not survival, nor killing. The objective is bringing the flag home, or breaking the wall or something like that. The zerg gives the socials positive feelings. The train of sieges is a magnificent view. Like a cavalry attack, horses riding out from the duststorm they create, flags waving, riders waiving their rifles, just like in the movies. Too bad that WWI have shown that "magnificent cavalry assault < dirty, rusty, oily machine gun in a muddy nest". Proper strategy always wins over a zerg. A single demolisher can destroy the last door while the whole "defense" team are jumping and lolling somewhere as "teh wall is ok that side". But such surprise actions are alien to the social mind. Actually the "let's break one wall, die and sneak back 5 minutes later when they left" or "run to the flag interrupt their capture and die to win 10 more secs" are alien to their ape-subroutines as they are designed to avoid death at all costs. There is nothing I can do to prevent socials pointlessly joining zergs. All I can do is creating a pre-made consisting intelligent group members who can overcome their useless social subroutines. Daniel was nice with 9 people who joined a pug organized by Dual wielding blood DK. He told them about their RL's ways and they disbanded. Later he tried to convince him to spec frost if he wants to DW with little effect. Update: he speced frost since the picture, so he may learned. Want more morons? Send more morons! But if he respecced frost, his name wouldn't make any sense anymore! The Siege train is a remnant of times when WG was so popular that it was seriously unstable and laggy. A siege train had the obvious advantage of being able to move without being CCd, as well as being impossible to damage in a reasonable way, since to the other side, it would appear it was teleporting across the battlefield. Such, a train could bruteforce 2-3 walls before it could be stopped. Not to mention that at the beggining of the expansion, people were doing 2-3k DpS standing, while now the same people can do 10-11k. Damage has quadrupled, the life expectancy of a train is 25% of what it was at the beggining of the expansion, even in perfect no-lag conditions. You discussed this in your AV post a while back. tactics that were good but are obsolete now will live on due to inertia. Sure, he uses pvp enchants (shoulder, head) and has still a blood/unholy glyphe. his spec is also not perfect (i would say) but he uses a frost spec now which is still kinda ok.
Basically: Just because someone doesn't publicly agree doesn't mean that they won't think about it. There is the possibility to try and uphold the public appearance and still change on critical input. what does "ur just like obama" even mean?! Yep, I agree with Andru. The train enthusiasts aren't stupid, they're just living in the past. I have been on the receiving end of absolutely humiliating crushing defeats due to siege trains - in the early days of WotLK and Wintergrasp. A single siege can often accomplish what a group of sieges can not: go undetected. I got a single siege through the front gate and the wall after that, while the defenders kept focussing on the "large-inc-east"
He WANTS to spec blood and he WANTS to dual wield, no point in telling him this is not good. I smell political debades upcoming. On my server (argent dawn EU) the horde don't often have WG. I have looked up tactics and not located any good attacknig ones. It starts off well get there early kill guns get promoted build siege and attack but the middle/end game we struggle. We lose towers as alliance attack with a lot of numbers then they outnumber our attacks and we fail. Any tips for mid/end game of WG? That's exactly the mistake that I meant. He is frost now, he didn't even insult back or anything (just evading the topic). He was doing something stupid and people told him so. He tried to keep his 'honor'/'respect' or whatever but while unobserved accepted the input. In the end, that doesn't fit the definition of a moron. Also your argument implies to me that a person who knows and accepts that something is bad but still wants it is the moron. I strongly disagree if that was what you meant. To me a moron is someone who wants a thing while thinking it's superior and exactly NOT accepting the fact of it being a 'bad' (on dps) choice. What is a good strategy? The one that in theory is the best or the one that works on the field an makes you win? If your opponent is stupid and outnumbers you, then a train has often been a viable option on my realm. There are just too many variables tmho to say that one strategy is the best over another (your realm, ratio, time of the day, tenacity, ... etc). a) On my realm forming 2 trains of 5-6 sieges from both sides will knock down 2 walls. That has proven to be successful over and over. So for the next attack they'll have to split up. Then it's a matter to stack up 7+ sieges at east or west, and drive 10-15 yards next to each other, not in a train. They can't target anything at the same time and WG is simply less organized here than on premade ones. Even forming a train to create a diversion will give attackers from the other side a free ticket to the final gate. b)I'm a multiboxer and whenever after peak hour, as soon as I get my kills I form my own train (4 sieges on /follow) and 8/10 times I make it to the final gate. So saying that forming a train is plain stupid or that it's an outdated strategy is being ignorant. You fail to see the many different circumstances in WG where a train does make a valid strategy, simply because it will make you win. PVP is quite a lot about adapting your game/strategy depending on your opponent. It wouldn't be the first time that a superior strategy loses from the dumb because they fail to adapt. Hmmm. On my realm we often barely have enough people show up to attack from one side, let alone two. Hard to have 6 sieges coming from each side with 10 players. And as far as strategy, how is anyone supposed to learn "proper" strategy? I constantly see people complaining in raid/battleground chat about how stupid the other players are (and based on our WG and battlegroup results, they are probably right) without giving constructive guidance/directions. The one direction I constantly see given in WG is "You have to stack sieges". Based on my personal experiences (usually running with tenacity of 8+) this seems reasonable, as I can actually sometimes get my siege to touch a wall if I am stacked on top of another one, but will get burned down to zero well short of the wall if I go in alone. Of course it is possible there really isn't a good strategy to take over the fortress playing 10 on 50. Moron Poster Here. Actually, he went 2 handed unholy. If I said he went frost in the email, my mistake. Armory here: http://www.wowarmory.com/character-sheet.xml?r=Eitrigg&cn=Bloodftw. So While he did switch to a viable spec, he's still got some major problems. Gemming AP, tank sigil, way over hit cap, no meta. And to the anon's saying that he knew DW blood was bad, he didn't. The conversation I had with him had a lot of "but I do 5k lol" and "But I've got nerves of cold steel lol" in it. Stacking sieges is effective if your opposition doesn't know how to use RPGGs properly and turrets are down. If they do, or if you can be focused by a few turrets on your approach, then it's suicide. Having said that, the point of a 'train' is not to stack them on top of each other (hence incurring massive AoE damage), but instead, to literally have a train following each other, a bit of space in between. As a result, if you hit with a turret, for example, the lead siege engine will be hit for 6k, the second only hit for 2k, and the third won't be hit at all. W ground troops and X turrets and Y RPGG gunners can only do Z DPS to a train of tanks. Providing that the time it takes to wipe out those tanks individually is greater than (time taken to get to the wall) / (number of tanks), then you're going to get some damage in. Chances are, in most WGs, it's fairly significant damage. Especially if you open with Demolishers (who can pound the walls at range while running up), and close with Siege Engines, which can take more advantage of actually getting to the walls. Seems like I picked the wrong server. So ok, yeah, ok. Ignorance makes someone a moron in my eyes. Ok how is Lifegoeson a stupid name (and not Ticklez or Stabsalot)? I don't want to defend Socials or socialism, but I think you are overselling it here. Blizzard has designed to game to train people that solo in BG is bad. At at least the foils to your story learned that. At least after 3.0.0 UnDK or RetPal, charging in 1 vs 3 (instead of waiting for others) to a resource node is about HK or ePeen, not winning. I don't play IoC much, but assumed the calls for group up of vehicles are reasonable. My experience is that in other BGs assaulting and taking one resource node works out better than assaulting three and taking zero. Off the top of my head, i can't think of another BG where some strategy like "group up; don't be dumb" is not preferable. premades may do better jobs of keeping pressure on other nodes, but if my fellow randoms are at least do things in a coherent and coordinated manner, I am happy and surprised! And aren't turrets relativel irrelevant now? Didn't you blog that most people can do more DPS not in a gun? I can't really speak to WG tactics now, but M&S who group up in a BG are far ahead of the typical M&S. Given the number of people who see WG as free gems and gear versus serious eSport, I think if I had the choice of those "group up" M&S versus the typical entrant in the WG queue, I would take the "group ups." As I frequently remind people, just because something is a bad idea/outcome does not mean it isn't the best available. OK, fair enough that you believe that a train is a bad strategy for WG(Wintergrasp, if you want to argue against abbreviations in common use)... however, generally it is a GOOD strategy against a disorganised enemy. Unfortunately I have to say that the bulk of strategies employed in WG could be classed as disorganised.